There are some books which come to you with baggage; glowing reviews, high status and a weight of expectation that you’re about to read something classic, important and brilliant. Often, this can have the effect of putting you off reading it, or at least make you a bit nervous, and I confess that I was a little apprehensive as I came to start “The Leopard” (and it did take me a few attempts to get going). I’d read such wonderful things about it on blogs I respect that I really hoped I would get out of it what others had! Risorgimento (meaning resurgence) was the Italian movement to bring all the small sovereign states together into one united Italian nation. This is the political background of the novel and against this we follow the decline of a noble family from Sicily, that of the Princes of Salina, embodied by Don Fabrizio Corbera, the current Prince. The story spans the years from 1860 to 1910 which is a surprising breadth considering the length of the book (190 pages). The Prince is the absolute patriarch of the family, with all its members (wife, sons and daughters, family priest Father Pirrone, servants and vassals, down to the dog Bendico) subject to his will. The one person seemingly able to get his own way with Don Fabrizio is his nephew Tancredi, a dashing and slightly irreverent young man who captures the heart of a number of women. Don Fabrizio’s interests are astronomy and women, in which he can indulge at will (though one of these interests often causes his highly religious wife to have hysterics). He’s in total control at the start of the book, powerful and cynical, able to declare: “Love. Of course love. Flames for a year, ashes for thirty.” However, the winds of change are reaching Sicily in the form of the movement to unite Italy – Garibaldi is on the march and the Prince can but hope that once Italy is joined, the nobility will be untouched and the class system will remain. We follow the family as time progresses – taking a holiday break at their estate at Donnafugata; following the affairs of the heart bothering the family; watching the change of status of the merchant class as money begins to take precedence; and seeing the awareness dawn on Don Fabrizio that the nobility will inevitably decline. The beautiful Angelica, with her lack of class but excess of money, will be pivotal in this change. As the story moves to its inevitable conclusion, we see the world switch before our eyes from an almost mediaeval one to the modern, familiar setting we can recognise. In some ways, a simple summary of this book is pointless, because it can never convey the richness of the writing. The prose is wonderful; the characterisation excellent; and reading this, I felt as if I was in the heat of Sicily, living events alongside the protagonists. Tomasi di Lampedusa brilliantly captures the subtle changes in the life around Don Fabrizio and his growing awareness of the failing of his dynasty. We were the Leopards, the Lions, those who’ll take our place will be little jackals, hyenas; and the whole lot of us, Leopards, jackals, and sheep, we’ll all go on thinking ourselves the salt of the earth. “The Leopard” definitely lives up to the hype; it’s wonderfully written, completely absorbing, elegiac, moving and poignant. The subtlety of the narrative, the weaving together of the strands of the tale and the incredibly atmospheric mood of the book are quite outstanding. It’s impossible, really, to do justice to it in such a short review and I can understand why it’s considered one of the most important Italian novels. 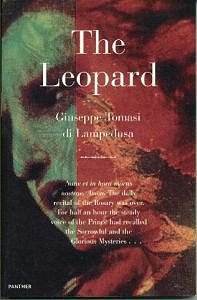 Having hesitated a number of times before jumping in, I’m now so glad I’ve read “The Leopard”. I guess many readers will recognise the situation of becoming aware of a new series of books you think you’d like; not quite getting round to reading them; and then suddenly finding the series has reached the tenth book and you haven’t even got started on them yet! That happened to me with Christopher Fowler’s Bryant and May series: I’ve been circling them for ages, thinking they sounded very much my kind of thing, but I just haven’t been in the right place at the right time to start them! So I was delighted when I was contacted by the publishers of the series to ask if I’d like to review the latest volume, “The Burning Man” (out today), and also take part in a blog tour. A little Q&A session with the author should appear here in April (watch this space!) 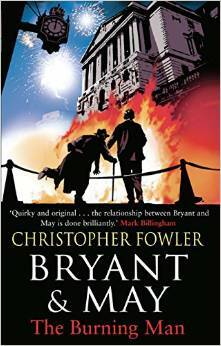 but in the meantime, let’s get to know Messrs. Bryant and May! Fowler’s website has a useful potted history of the detectives: “Arthur Bryant and John May are Golden Age Detectives in a modern world. They head the Peculiar Crimes Unit, London’s most venerable specialist police team, a division founded during the Second World War to investigate cases that could cause national scandal or public unrest. Originally based above a London tube station, the technophobic, irascible Bryant and smooth-talking modernist John May head a team of equally unusual misfits who are just as likely to commit crimes as solve them.” The site itself is well worth a visit and Fowler has an interesting blog too. I was hoping to enjoy this book, but I hadn’t expected to like it quite so much! Bryant & May are a perfect team; sparking off each other, supporting each other and prone to flashes of inspiration. The supporting team of the PCU are beautifully drawn, all with a back story waiting for me to discover it (! ), and the book is full of some real laugh-out-loud humour. But it’s also dark in places, with the seamier side of London and modern life making itself felt. What was a real joy for me was the fact that the book didn’t give in to the current trend of detailed descriptions of gratuitous violence against women. There were nasty killings, yes, but they were never dwelt upon in a prurient manner, and the threat was real but not ghastly. Arthur Bryant has a brilliant (if somewhat erratic) mind and seems to solve cases through a mixture of erudition and intuition. He often seems to be rambling on and on about something that’s really not relevant to the case, displaying a wonderfully arcane knowledge of London and its history, but actually he has more of a grasp on the case than anybody else. The relationship between Bryant and his colleague John May (slightly younger, a bit of a ladies’ man) is deftly portrayed and they obviously understand each other well after a lifetime of working together. The rebellious streak in the two detectives is appealing, and the constant stress they cause their (notional) superior Raymond Land (the Unit’s chief) is very, very funny. There’s also room for the subtler emotions too, as Bryant strikes up a tenuous friendship with the young son of a suspect. Although the intention is really to try to find out about the father’s movements, in the end Bryant brings a new dimension to the lad’s restricted life, and has some unexpected moments himself. The city of London itself is a major element in the plot, and I would guess that Christopher Fowler has a great love of the place himself. The book conveys a wonderful sense of the long and strange history of the city, and the sheer oddness of some of the things that have happened there. 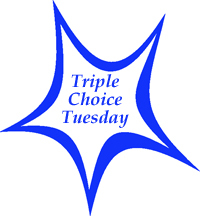 Reading Does Matter – a Triple Choice Tuesday! Reading Matters is an excellent blog run by the lovely Kim, and she has a regular feature called Triple Choice Tuesday. Here, bloggers, writers and readers get to highlight three books that mean a lot to them! Kim was kind enough to invite me to take part, and my selection of books can be seen here. Yes, I know that’s a bit of an alarmist headline, but unfortunately yesterday brought bad news in the form of the fact that the only local “proper” second-hand bookstore, Claude Cox Books, is closing down at the end of March. I was a little gutted to say the least – it’s been a fixture in Ipswich as long as I’ve known the town and it means that we’ll only be left with Waterstones and the charity shops. That might sound pretty good, but two of the charity shops have closed in the last few months and another has a “To Let” sign up – so prospects are not great, and I may end up having to take the train to Felixstowe on a regular basis to visit the wonderful Treasure Chest books, just to get a second-hand book fix. It’s a Women’s Press volume from back in the day and sounded up my street – and a bargain at £1. All the books were half price, and I could have bought many more, but since I’m having space issues I had to refrain. 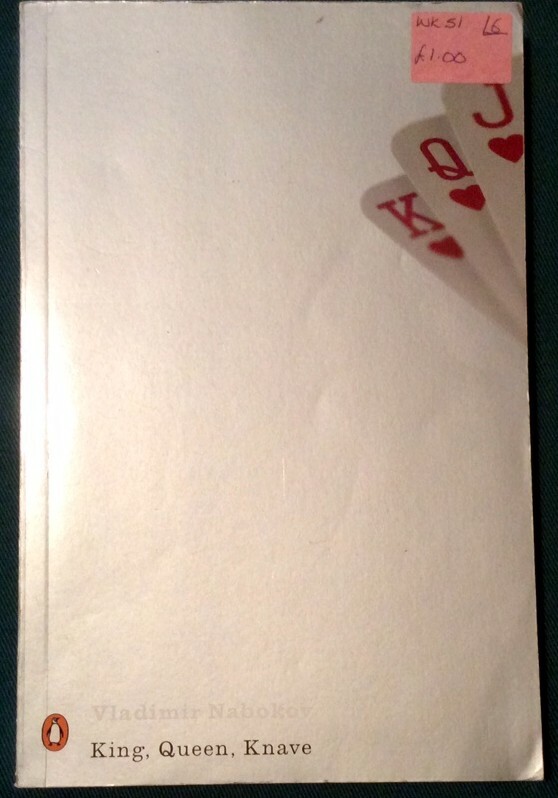 I have this one as part of a large hardback omnibus of five stories but it’s so unwieldly that I’m trying to replace it with individual books – three down, two to go! And finally, from the Samaritans Book Cave, a pre-loved but still appealing Virago! 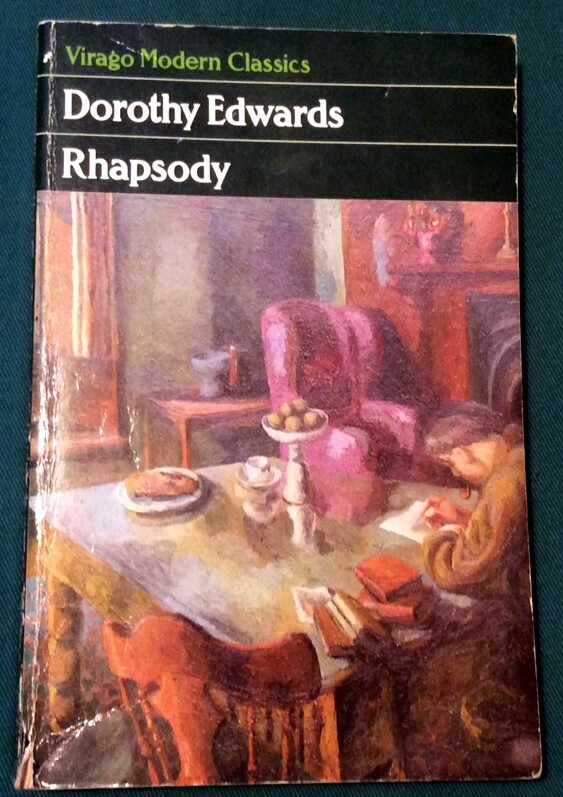 This is by Dorothy Edwards, a Welsh author who died young. 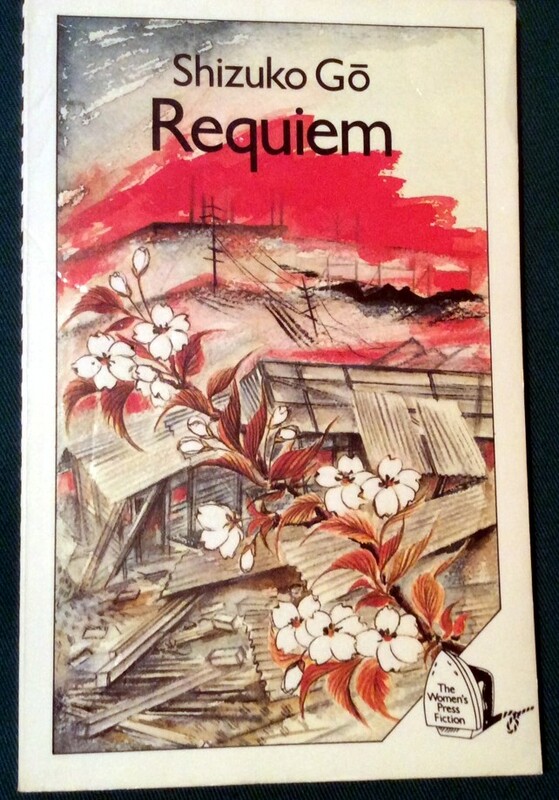 I have her Virago novel also, so it was nice to find this matching collection of short stories. at a sixty-watt sun in that sky. sitting there what to do with my hands. as I sit in my circular room. of a life where no issue I see! my own self and the things around me? to myself as I sway in a swoon. and a word may be stronger than man. pointed blade seems to enter my breast. past my brow the cool galaxies flow. of the poor things that listen to me. handed me by a ghost through the gale. this is Orpheus standing alone. Penelope Lively is one of those British authors that we somehow almost take for granted. She’s been writing fiction since 19970, starting with children’s books and then moving onto adult novels, and is still producing work (her most recent being a memoir in 2013). I first encountered her through the children’s books which I read in my young adult years and loved for their mixture of fantasy and reality, tapping into the oldness of Britain and its legends and past. There was much wonderful children’s fantasy produced in the 1960s and 1970s and I’d like to revisit it one day. However, I’ve not yet managed to tackle her adult novels (although there are several lurking on Mount TBR). 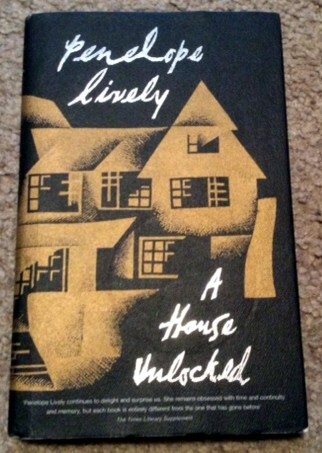 This volume, an autobiographical work based around her grandparents’ house, seemed a steal for 50p in the charity shop and was excellent reading during my recent struggles! The house concerned is Golsoncott in Somerset, and Lively takes the novel approach of selecting a particular aspect of the building and its contents, using this as a jumping off point for a series of meditations on all manner of subjects from the decline of Pelican blue covered paperbacks to the shifting expectations of women from the 1950s onwards. Memory is the key here – the book was published in 2001 and Lively is contemplating the changes that have taken place during the previous century, much of which she has lived through, and that which she hasn’t she has fairly direct knowledge of. It’s a fascinating idea, and makes for an engaging book and some very thought-provoking discussions. From what I recall of Lively’s fictions she’s very concerned with how the past and present interlink and inform each other, and that’s very to the fore here. She’s constantly exercising her memory to recall the layout of the house, which still exists, but only in her head. And she’s very good at getting into the mindset of a person from the past and imagining how they would have perceived things. On the journey through Lively’s houses and meanderings we meet a wonderful array of characters – most notably her formidable grandmother and her artistic aunt Rachel, both striking personalities in their own right. Then there are those who have dipped in and out of the life of the house, including evacuees from London, a refugee from Nazi Germany and another from the Russian revolution. All have their stories to tell and Lively includes them all here. 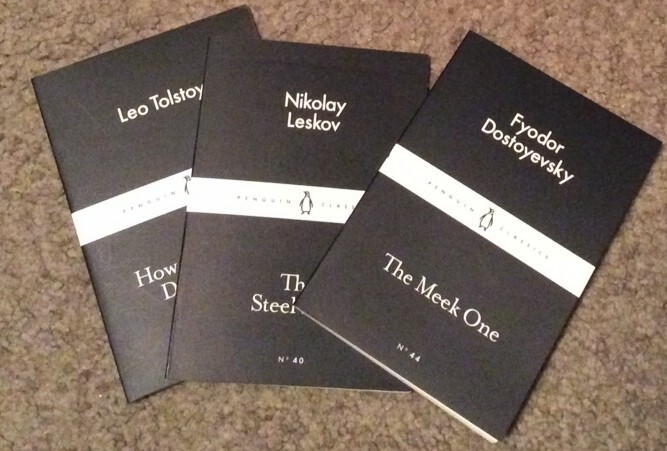 Little Black Classics – The Russian Edition! It’s been common knowledge round the Ramblings that I’ve been suffering from a bit of a reader’s block – not a thing that happens often, but nevertheless very painful when it strikes. For days I was unable to settle to reading *anything* at all and began to wonder if I would ever be able to get through another volume. 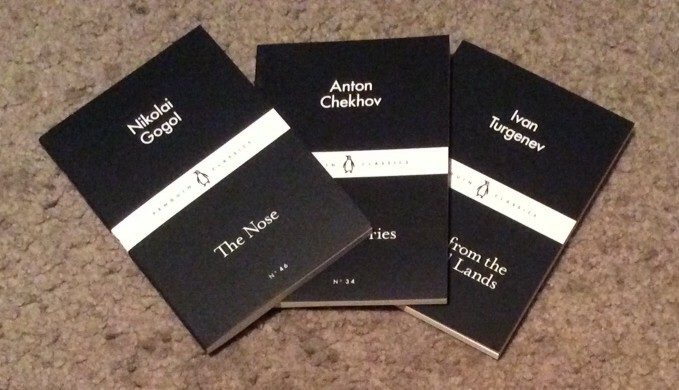 Fortunately, salvation came in part from the Penguin Little Black Classics! Commendably enough (in my view, anyway) the series features number of classic Russian authors, all of whom I’ve read and all of whom I love. So these were the perfect way to revisit them in small bites and ease back into reading! I tackled them in the order below and I’ll share just a few thoughts on each. Nikolai Vasilievich Gogol (1809 – 1852) is one of Russia’s most important authors, and generally regarded as the country’s first realist writer. He wrote on classic novel, “Dead Souls”, and some brilliant short works; this volume contains “The Nose” and “The Carriage”. The first is one of his most famous tales, in which a Collegiate Assessor wakes up one morning to find that his nose has disappeared and taken on a life of its own. Of course, without a nose of his own, it’s quite impossible that he should appear in his normal circles, and the story follows his attempts to track down his nose, which makes appearances here and there wearing a uniform and attempts to establish its existence in its own right. This is wonderfully absurdist nonsense which shows up the prejudices of the class system and civil service in Russia as well as being very, very funny. “The Carriage” is a cautionary tale about what happens when you get drunk and boast too much. 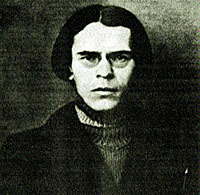 The protagonist, Chertokutsky, lives in a small town which goes from dull to lively when the army is posted nearby, and is foolish enough to brag about the wonderful carriage he possesses; unfortunately, owing to imbibing just a little too much he oversleeps and forgets to warn his wife that there will be officers calling on them the next day to have a look! Gogol was a satirical genius and these tales display his talents brilliantly! Turgenev is possibly best known for his novels (and his famous dispute with Dostoyevsky) but he was also great at the shorter form. There are two stories in this volume, the title one and “District Doctor”. The latter is very moving, the tale of a provincial doctor and a lost love. The title story portrays serfs living on the land, the hardships they endured and the strangeness of some of their beliefs. Turgenev’s tales apparently helped with the campaign to abolish serfdom, and they’re also excellent reading. Tolstoy also needs no introduction; the giant of Russian literature produces works that were as short as “War and Peace” were long! The two stories here (the title one and “What Men Live By” are suffused by Tolstoy’s faith and “How Much Land….” (a parable of a peasant’s bargain with the Devil) is apparently considered by James Joyce to be the world’s greatest story. I don’t know about that, but it’s very powerful and thought-provoking! I was particularly delighted that Leskov was included in the LBCs, as he’s a Russian author that often doesn’t get as much attention as the others. Also, he’s suffered a lot at the hands of translators as his particular style of vernacular speech and punning is apparently very hard to translate. The version of one of his most famous stories (also known as “Lefty”) is in the translation by William Edgerton, which comes highly recommended by ace translator Robert Chandler (for his thoughts about working on Leskov, see here). This is a fabulous and fantastic little story about the rivalry between craftsmen of different nations (and thus the nations themselves), rendered with verve and lots of punning! Last, but most definitely not least – the wonderful Dostoevsky. I’ve read many of his longer works but less of his short ones. This is a magnificent piece of writing, 57 pages of pure genius. The style recalls that of “Notes from Underground” in that it’s in the form of a monologue by an unreliable narrator. He’s a pawnbroker and he’s telling us the story of marriage, leading up to his wife’s story. Initially we’re unsure of the facts, but as the story unfolds it becomes clear that the pawnbroker has a somewhat disreputable past and much of what happens is due to his obsessive love of his wife, his inability to express his emotions and his stifling of any natural relations with his wife. As the story builds to a climax, the tension is almost unbearable and the powerful narrative is totally absorbing. At the end it’s not even clear which of the two is the meek one of the title, but the tragic story is brilliantly told. Dostoyevsky is a writer of genius and if you were only going to read one of the Russian LBCs then I would really say that this is the one! So a wonderful reading experience with these little books. I don’t think I’ll ever tire of reading the Russians and fortunately there are still plenty I haven’t tackled yet!